How to access the full text of your favorite articles. Choose the appropriate article that is related to your field of interest. The page will open for you a variety of online databases. Scroll down to see PubMed, click on it. A “Sign In” page opens. Please log in using your LAU username and password. Copy and paste the article’s name there and press enter. You will get the article’s abstract. 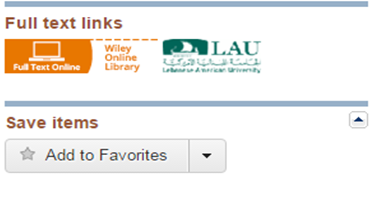 On the right upper section of your screen, you can see if it is available through LAU’s Library. You can then access your full text from there.